I'm Shelf-ish: Wings of Tru Love by Kenneth C. Drinnon Book Blast - Win a $25 Amazon Gift Card! Wings of Tru Love by Kenneth C. Drinnon Book Blast - Win a $25 Amazon Gift Card! Wings of Tru Love author Kenneth C Drinnon joined the United States Army Air Force in 1943 and served in the European Theater as a B17 ball-turret gunner with the 8th Air Force, 487th Heavy Bomb Group, and 838th Squadron. He flew thirty-four aerial combat missions from October 22, 1944 to February 28, 1945 over Nazi, Germany and attained the rank of Staff Sergeant before being discharged in 1945. There were several notable bombing missions, including the synthetic oil refineries at Merseberg, Germany and several against transportation facilities in support of the Army ground forces during the Battle of the Bulge, but the one most remembered by aviators of the 487th Bomb Group was December 24, 1944 when General Frederick W. Castle was killed while leading a two thousand plane bomber mission for the Eight Air Force and piloting the lead plane of the 487th Bomb Group. Both the 487th Bomb Group and the Luftwaffe suffered many casualties during an aerial gun battle. 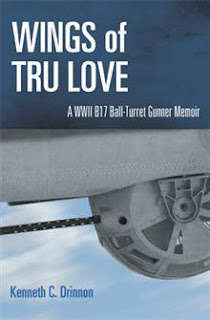 Wings of Tru Love author Kenneth C Drinnon joined the United States Army Air Force in 1943 and served in the European Theater as a B17 ball-turret gunner with the 8th Air Force, 487th Heavy Bomb Group, and 838th Squadron. He flew thirty-four aerial combat missions from October 22, 1944 to February 28, 1945 over Nazi, Germany and attained the rank of Staff Sergeant before being discharged in 1945. There were several notable bombing missions, including the synthetic oil refineries at Merseberg, Germany and several against transportation facilities in support of the Army ground forces during the Battle of the Bulge, but the one most remembered by aviators of the 487th Bomb Group was December 24, 1944 when General Frederick W. Castle was killed while leading a two thousand plane bomber mission for the Eight Air Force and piloting the lead plane of the 487th Bomb Group. Both the 487th Bomb Group and the Luftwaffe suffered many casualties during an aerial gun battle. This book was originally self-published by the author in 2004 in order to provide a copy of his memoirs to The Mighty Eighth Air Force Heritage Museum, Savannah, Georgia and commemorate sixty years since his WWII combat experience. His Tru Love Crew (also known as Gasser’s Crew) first got back together in 1989 where forty-five years later they naturally reminisced about the closeness of their time together as a tight nit group going into battle. This meeting inspired some to begin writing down their combat memories as well as their accomplishments after leaving the Air Force. As a result, his WWII memories plus some intervening lifetime memories that he was able to accomplish due to that short period of service in the US AAF is recorded in this book Kenneth Cleveland Drinnon a native of Hancock County, Tennessee was born in Lee County, Virginia November 30, 1924 to Glenn B. and Willie Mae Overton Drinnon. He attended Mulberry Gap Elementary School and graduated at age seventeen from Hancock County High School at Sneedville, Tennessee in 1942. Following his USAAF service he attended Lincoln Memorial University for two years and graduated from the University of Tennessee in 1950 with a Bachelor of Science degree in Electrical Engineering. Employed by the Tennessee Valley Authority in the design of Electric Power Generating Plants for thirty-two years and became a licensed Engineer in Tennessee. He married Janis Bolton while attending Lincoln Memorial University and had one daughter, Dena Daryl Drinnon, who married David E Foulk and had three children, Bethany, Jonathan, and Julia. Kenneth is giving away a $25 Gift Card!